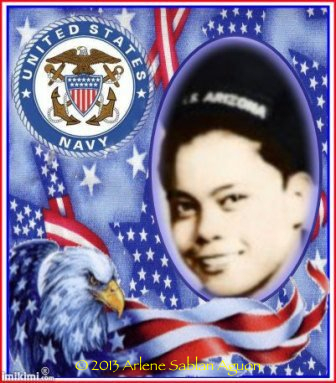 Pedro Aguon, affectionately known to his family and friends as “PoP”, was a decorated Navy veteran and a Pearl Harbor survivor. PoP was an inspiration to many, not just for his service to our nation, but for his love of life. 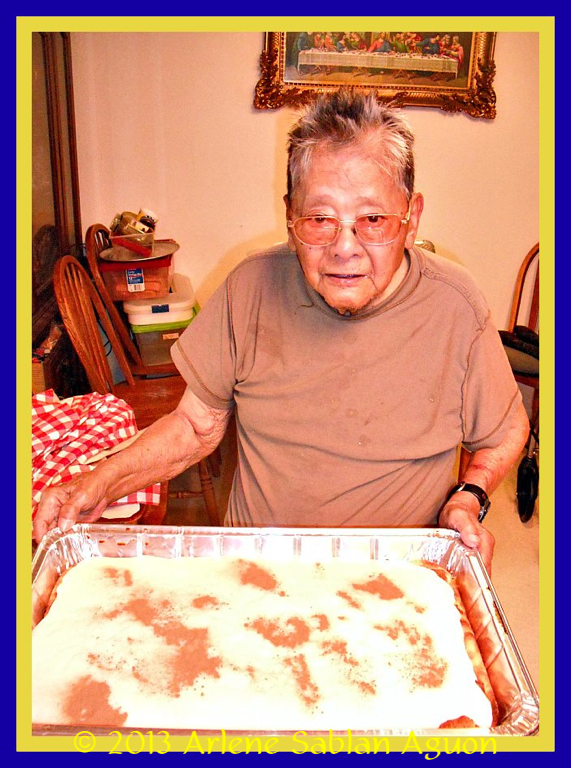 This recipe posting is dedicated to PoP’s memory, and to his desire to keep the Chamorro culture alive through the sharing of one our island’s treasures ~ our food. Rest in Peace, PoP. You are greatly missed. “Please note that my father DID NOT measure his ingredients, so I am attempting to record what I saw. 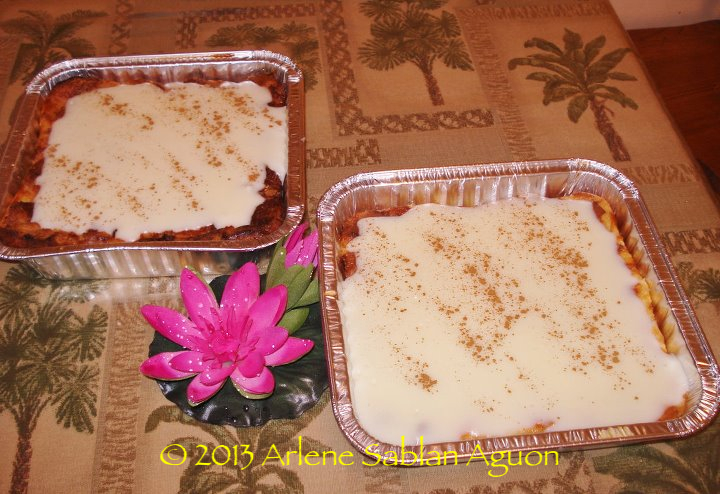 He usually prepared a huge banquet sized pan of pudding for our gatherings so you can downsize as needed. 1 loaf of FRESH bread (white, wheat, whole grain, according to your taste). Break it down to small 1/2 inch cubes or torn pieces. Lay the bread pieces in a prepared buttered or Smart Balance/Pam sprayed heavy pan. (One loaf = 12 cups of bread pieces). 1. Slowly beat your eggs, butter, salt and gradually add your milk and mix until fully incorporated. Add your vanilla. Gently pour your wet custard solution over your bread in the pan. IMPORTANT: Do not push down the bread. Let the bread NATURALLY soak up the wet mixture for at least 15-20 minutes. 2. Place the pan in a pre-heated oven set at 350 degrees. Bake for an hour and a half. Your bread pudding base will puff up to a soufflé texture. DO NOT PIERCE OR TOUCH! The soufflé texture will be jiggly. Remove and set on a rack to cool. As the bread base cools the soufflé texture will start to compact and settle. 1. Whip the eggs, sugar, cornstarch, 1 cup of milk, butter, and salt in your blender or with an electric mixer. Meanwhile, in a heavy saucepan on low heat, warm the rest of your milk on a low setting (DO NOT SCALD your milk on a high setting). Gradually add your mixture into the warm milk and constantly stir, so your eggs will be tempered. Stir from the sides and bring to the middle of your saucepan to prevent lumping. 2. Once the custard starts to thicken and bubble, cook to the desired consistency. PoP did not make his custard thick like Latiya. 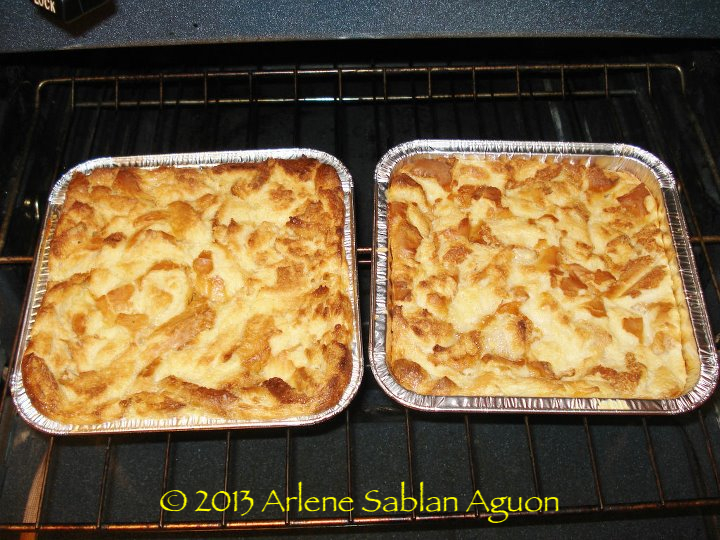 He made it a little runny so it will seep into every nook and crevice of the bread pudding base. Remove from heat and add your vanilla extract. Cool for at least 15 minutes then pour the custard over the bread pudding base. 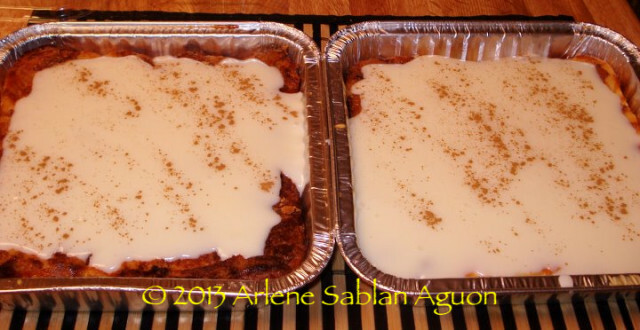 Sprinkle the top with cinnamon and ENJOY.